Since all of our officers have been translators for refugee organizations both in and outside the US, it is very good that they want to translate for DOHS! They are each able to translate Arabic and Massalit to English, and English to Arabic and Massalit. To see the list, click on the Translator List button beneath our name at the top of our homepage. The Board will be interviewing more people to place on this list soon. And DOHS has received another generous donation from another member of the Louisville community who wants to make sure that Darfuri refugees here have what they need. 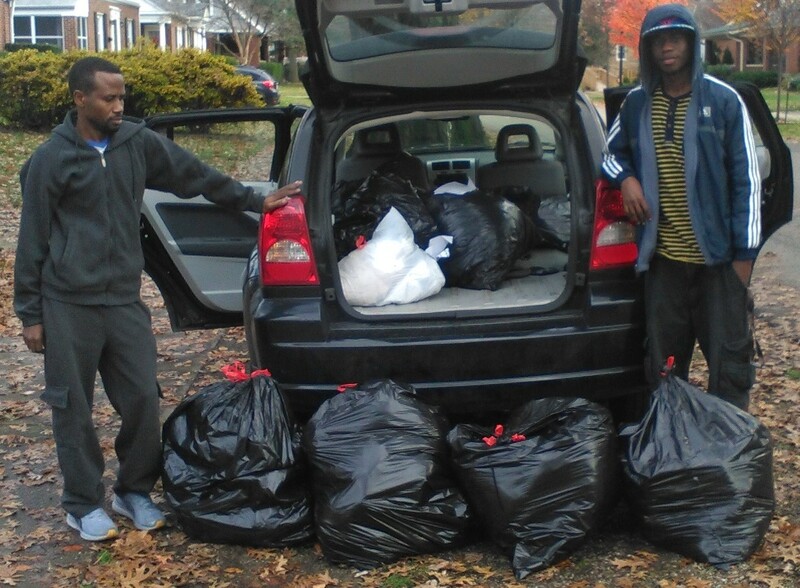 Khamiss Youssif received comforters, blankets and bed linens and, with the help of Mohammed Adam Abdullah (one of our members, pictured on the right) dropped them off at DOHS headquarters on Dec.1, 2015. The Board plans to send at least some of this and earlier donations to recently-arrived families in Chicago. Happy Thanksgiving! Four newly-arrived Darfuri families receive DOHS clothing and blankets.